John Paul Strain's "Fire in the Valley." In the final days of 1862, just outside the little town of Middleburg, Virginia, Major General J. E. B. Stuart made a historic decision. Speaking to a scout on his staff, John Singleton Mosby, Stuart told Mosby that he was going to give him nine men and allow him to put into action a concept that Mosby had been espousing for several months. That concept involved remaining in the enemy’s rear to disrupt his activities and draw forces away from their primary fight against Lee’s Army of Northern Virginia. From that tiny spark came a roaring fire that the Yankees (the enemy Mosby hoped to disrupt) were never able to fully extinguish. Indeed, at the end of the war in 1865, Mosby’s men – now formally known as the 43rd Battalion Virginia Cavalry, but more often called Mosby’s Rangers – disbanded rather than surrender. Mosby was a skilled leader, excellent tactician, tireless in his efforts to gather information for future operations, charismatic, and personally courageous, but a commander does not achieve success in battle without good men executing his plans. Mosby had such men. Beginning with the nine veteran cavalrymen from the 1st Virginia Cavalry “loaned” to Mosby in January 1863 – Stuart increased the number to fifteen a few weeks later. Mosby’s command progressed from “Mosby’s Conlmerates” to the official 43rd Battalion Virginia Cavalry formed on June 10, 1863. As reports and rumors of Mosby’s earliest successful raids against the enemy became known, the ranks of his little band increased almost daily. Men, individually or in small groups, made their way into Loudoun or Fauquier Counties in search of an opportunity to join Mosby. The influx of new warriors continued to the very end of the war. The new recruits were generally young, at least one being 14 when he joined, but there were older men, too. The men came mostly from Virginia, but at one time or another Mosby also had a Prussian, an Irishman and an Englishman riding with him. There was also a large contingent of Marylanders. Fifty-eight men who at some time matriculated at the Virginia Military Institute can also be called Mosby Rangers. The younger men, many without combat experience, but full of ardor for their young nation and courage enough to back up their passion, were joined by combat veterans who had already fulfilled enlistment requirements or who had been discharged from active duty because of some disability. The newcomers also included a surprising number of Confederate officers who had resigned their commissions in order to ride with Mosby as Privates. Almost without exception, the men who came into the unit were exceptional horsemen and all became, or were already, deadly with a pistol, the preferred weapon of the Rangers. Most came from fairly well-to-do families and had more than an average education. The post-war lives of many of the men underscore that, when the number who went on to college and became lawyers, doctors, ministers, politicians and highly successful businessmen is taken into consideration. Why did Mosby draw such men? 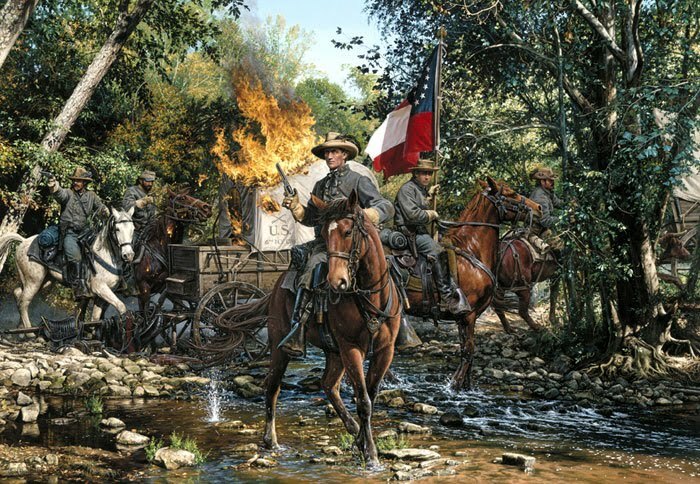 Detractors of Mosby’s Rangers will say that they joined only "for the “plunder.” While it was true that Mosby’s unit was formed under the auspices of the Partisan Ranger Act of 1862, which permitted members of such units to keep everything that they captured, that was not the only reason. They were seeking adventure and constantly living and operating behind enemy lines filled every day with tension, excitement, and danger. They had no desire to be part of regular military monotony, physical hardship and regulations. The Rangers all boarded in private homes when not on operations, they slept comfortably, ate well and often were in the company of young women who idolized them as their dashing and brave protectors. Some of the men wanted to punish the Yankees for invading their homeland, and riding with Mosby placed them directly in the middle of a target - rich environment. While many of the Rangers were young and seemed innocent enough when not “in the saddle”, they were deadly in combat and few shirked from their duty of closing with the enemy and delivering pistol shots at extremely close range. During the life span of Mosby’s command, almost 2000 men rode with him at some point, but the largest group ever to operate together at one time was the approximately 350 who took part in the Berryville Wagon Train raid on August 13, 1864. It was more usual for small groups of Rangers (10-50), ably led by men hand-picked by Mosby, to conduct raids, ambushes and scouts separately. Multiple small actions conducted concurrently enabled the Rangers to cause damage, confusion and alarm across a vast area and led to the feeling on the part of Yankee soldiers that Mosby was ubiquitous and almost phantom-like. Stories of wartime heroics often become legendary when they are repeated frequently over time. A small skirmish can become an enormous battle that changed the course of history. Individuals who perform a single courageous deed become almost mythical in stature and become known for achievements that never occurred. There is little doubt that such tales have grown up around Colonel John Singleton Mosby and the men of the 43rd Battalion Virginia Cavalry. However, as you learn about their very real and recorded accomplishments, you will come to find out that the actual events need no embellishing and that what this small band of brave men actually did over a period of almost twenty-eight months is almost unbelievable. Make sure that your mount is ready, check the loads of your four Colt .44s and come ride with Mosby! Scattered throughout Virginia are small groups of Mosby’s Rangers. At final rest now, they are inseparable from the fellow warriors with whom they shared so much in life, so long ago. Their identities and exploits remembered by few, they lie buried in separate graves – distinct individuals. Yet they seem connected, close enough to come to a comrade's aid should the need arise. The men who made up Mosby’s Rangers – the 43rd Battalion Virginia Cavalry – were generally young, seeking adventure and dedicated to the cause for which they were fighting. If asked why they were fighting, many would have responded that they were doing nothing more than defending their homes and families from an invader. Under Mosby’s leadership, they became one of the most outstanding unconventional fighting entities in the history of warfare. The Rangers regularly engaged much larger forces and rode away victorious. One young Ranger, John Tyler Waller – grandson of President John Tyler – was described as the “incarnation of recklessness.” Perhaps Waller was more extreme in his enthusiasm than his fellow Rangers, but few Union Cavalrymen would have denied the élan, skill and courage of the Mosby Men against whom they fought. Superb horsemen all, deadly accurate with the pistols they carried, often dressed in the finest uniforms paid for with captured U. S. “greenbacks”, and immune to the wrath of nature, the Rangers came to be dangerous phantoms for all men in blue in Mosby’s Confederacy. But not all of Mosby’s Rangers met their ultimate fate within the boundaries of Mother Virginia. If you continue your quest, you’ll discover some of them interred in the soil of the very states they had battled against so bravely in their youth. Venture even further afield, and you’ll find yet another former Ranger in San Pedro Sula, Honduras. The grave markers of the “Final Ride – Mosby’s Rangers” evoke a myriad of emotions in anyone who gazes upon them. Looking at these small, worn stones, who will not reflect on the fleeting nature – and fragility – of life? On the inevitable end that faces us all? Take heed, then, of the message of these markers and the remarkable men they commemorate. Accept the challenge of celebrating life to its fullest even while acknowledging the inescapable finality of death. Embrace all the years you have left and ride to the sound that inspires you most, be it the guns of war, the word of God, or the voice of a friend urging you to do your best in the world. Charlie Dear, now buried in Washington, Virginia, joined Mosby in 1863 when he was just 16 years old and was wounded by gunfire twelve times, slashed with sabers, beaten black and blue in the hand-to-hand melee at Mt. Carmel Church and had his horse, Old Thunder, roll over him during the war. He died when he was 82. Charlie packed multiple lives into two years and then rambled on for another sixty-four. Embrace the spirit of these men and cherish their noble actions. Remember, too, all of the souls, now departed, both Union and Confederate, who answered the call of their homelands. Never forget that every inch of countryside upon which they rode, marched, fought or died is hallowed ground. 2005-2011 by the Stuart-Mosby Historical Society (SMHS). All rights reserved. All images and articles are the property of their respective owners or SMHS and may not be reproduced elsewhere. Art work is used with the permission of the artists. This page was last updated January 3rd, 2011. The website solicits no personal information from visitors other than voluntary e-mail. Therefore, no information is shared with any organizations or other websites. If information is received which requests additions to pages with e-mail links, it is done at the request of the sender. We accept no responsibility for the content of other websites or for services or products purchased as a result of a link from these pages.